Plants rely on their roots for delivery of water and nutrients, not to mention for the structure that anchors them to the earth. Just as new leaves or needles grow in the springtime, roots also have a period of growth, or production. To better understand the relationship between leaf and root production, the authors of this study evaluated patterns in the timing of leaf and root phenology in deciduous and coniferous trees. They found that the timing of the production of roots and leaves are not tightly linked in a particular plant species. In many species, the production of roots happens well before leaves break their buds. While many studies have looked at the timing of leaves, few have studied the timing of root production. The authors expected that the timing of root production would follow that of leaves – early in some species, but later in others. But root production did not follow patterns in leaf production; root production peaked before leafing peaked in nearly all species studied. The authors found that the patterns they observed in early root production are likely linked to spring temperatures. Freezing temperatures are harmful to roots, so when temperatures rise, root production also rises. 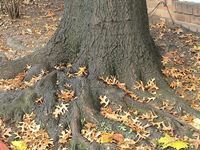 The warm spring temperatures we have seen in recent years, coupled with late spring storm events, could potentially be harmful to these new roots. This basic information is foundational for understanding the response of plants, and on a larger scale, of ecosystems, to changing climate conditions. The research team at Penn State behind this study used USA-NPN protocols to record their observations, and submitted their data to Nature’s Notebook. The data submitted to the National Phenology Database continue to be of great use to scientists and researchers who are making new advancements in their fields.